On all listings that have been assigned a price package with vouchers, you will find an “Edit Listing link” in the sidebar (as shown in the image). This link appears for both site administrators and the listing owner. Once clicked, this will take you to the Create Vouchers page if the listing has no vouchers or an Edit Vouchers page if the listing does have vouchers. If you are a site administrator, or a listing owner with multiple listings, a list of choices will be presented. At the top is a representation of a voucher showing what the final PDF download will look like. 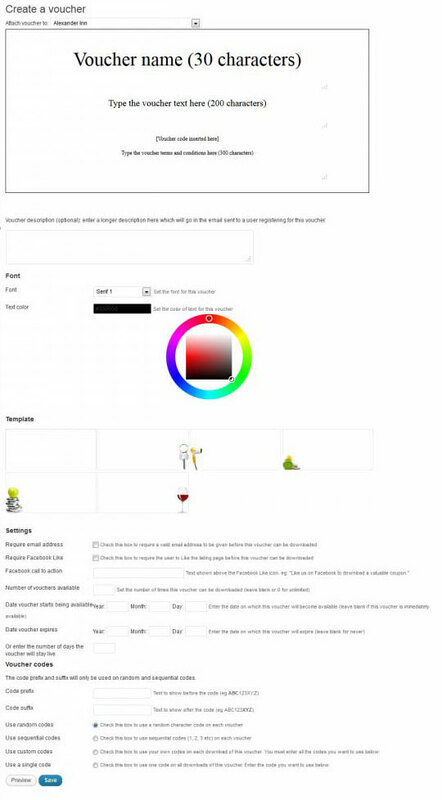 This area updates automatically with changes to the design and layout of the voucher. 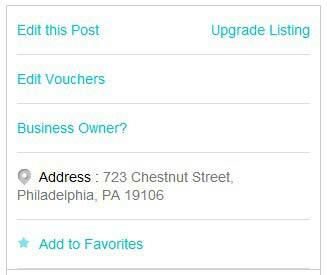 The text of the voucher can be edited by clicking on the area you want to change. The next text area allows you to enter some descriptive text that is shown when vouchers are presented as a list by category or city and in the email sent with the download link when email registration is required. Next you can set the text font and text color for this voucher. Changes made here reflect in the preview at the top. Available templates are shown next. Clicking on one will select it and update the preview above. Additional vouchers can be added by the site owner from the Vouchers menu on the left side. The next set of settings determine the behavior and availability of the voucher. Require email address: (should be default enabled) Sends an email to the user with a download link. This helps you to build a list of interested users and also restrict the access to each voucher to one per email address. Require Facebook Like: (should be in-active because not everyone uses fb) The user must “Like” this page of your site on Facebook before being presented with the download link. The Facebook call to action text in the next option allows you to customize how this is asked for. Number of vouchers available: You can optionally restrict the number of each voucher that can be downloaded. This works best with the Require email address feature. Without it, a single user can click download multiple times and effectively “take” all the available vouchers. Date voucher starts being available, Date voucher expires, and number of days the voucher will stay live allows a voucher to become active or inactive automatically on a given date. You can use any field without using the others. The section on Voucher codes gives several options for customizing the unique code on each voucher. This allows the merchant or site owner to track the redemption of coupons from the site and see the effectiveness of a campaign. Once you have created a voucher it will appear at the bottom of the listing to which it is attached once it is made active – either immediately or on the date specified. 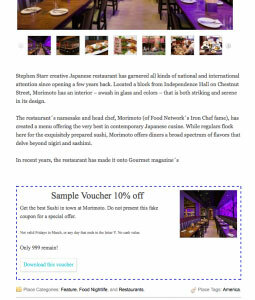 The image to the right is an example of a sample voucher on the demo listing for Morimoto. The blue dashed border is set through the settings page, as is the counter for how many are available. The vouchers will display the listing’s default image inside the box, not the selected background. Without doing anything else to your site, this basic function will work automatically and should serve most sites quite well. If you want something a little more custom, there’s a few options for that included below.